Zambia was what I was looking for in Africa. A red soil dotted with dry thorny trees, acacias and baobabs, where animals roamed freely. Birdsong filled the trees. Women wore their hair in elaborate braids swirling around their heads making them look regal. Taxis came in every make and model of car, their unifying characteristic a secondary aqua blue paint job. Monkeys were everywhere. Baboons hitchhiked on cargo trucks and scampered around in the streets like comedic vagabonds. The gray vervet monkeys with their quizzical eyes and pointed moustaches approached fearlessly stealing food, shoes and other unattended items from inattentive owners. I am not a morning person. I never have been one and I doubt I ever will be. So it was not for the love of mornings that I arranged a taxi pickup at 4:30am. The hotel staff said to leave an hour before our 6:10am flight, but this was Africa and I wasn’t going to take chances. 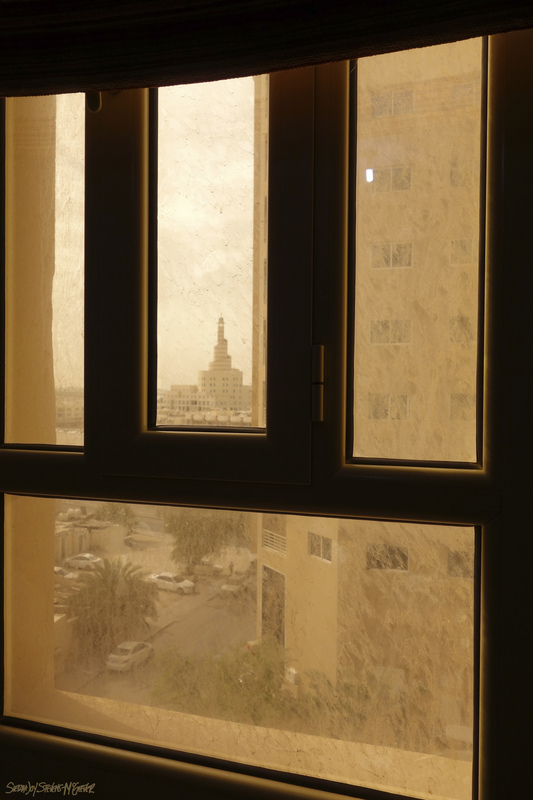 Experience in traveling has taught me that building in extra time is always a good idea. The wave known to the world as Jeffery’s Bay, or J Bay, is claimed to be the best right in the world. With all the miles of coastline, this is a big claim for a wave. We arrived with a big swell that had the surf town buzzing with excitement. As a cherry on top, offshore winds were also predicted for the entire swell. The drive from Cape Town to Wilderness took us through beautiful countryside that resembled a cross between California’s 101 and red rock country; wine lands and red mountains. We stopped along the coast for Dave to surf a picturesque right point break called Mossel Bay. I could not have asked for a better day to celebrate turning 26. I received the best birthday present I could have asked for: Duct Tape. The fiber optic cable connector for my strobe arrived faulty so I have been unable to use the brand new strobe I got for the trip. Over delicious cinnamon ice coffee and a banana pancake, I was able to jerry rig the fiber optic cable to the camera housing with duct tape. 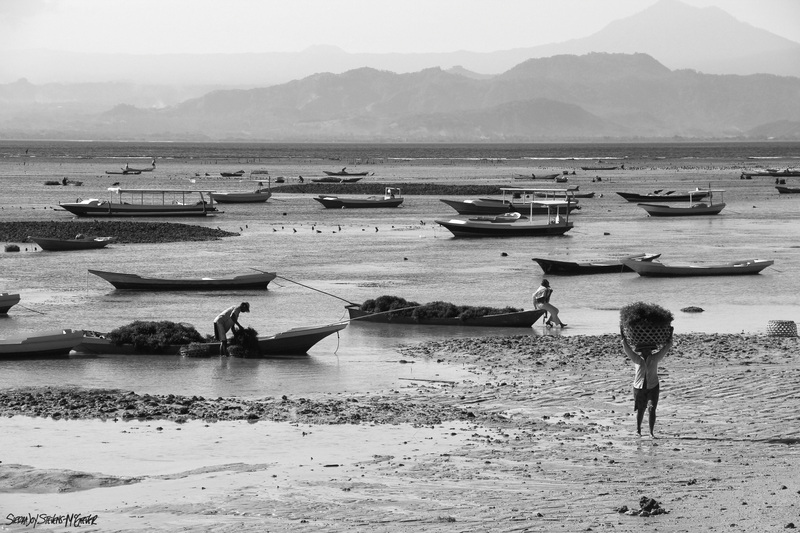 We took a taxi to Padang Bai, where we boarded a boat that brought us across the channel between Bali and Lombok over to the Gili Islands. Off the north west coast of Lombok lie three tiny dots of islands known for good diving, beautiful beaches and a wonderful atmosphere—the Gilis. Each of these islands is supposed to have its own ambiance, Gili Trawangan is the party island, Gili Meno is the locals island and Gili Air is the romantic quiet island. We had heard about the surf of Gili T so naturally that’s where Dave wanted to go. The boat ride skirted the beautiful Bali coast, crossed the channel and pulled up along the equally beautiful coast of Lombok then over to Gili Air. 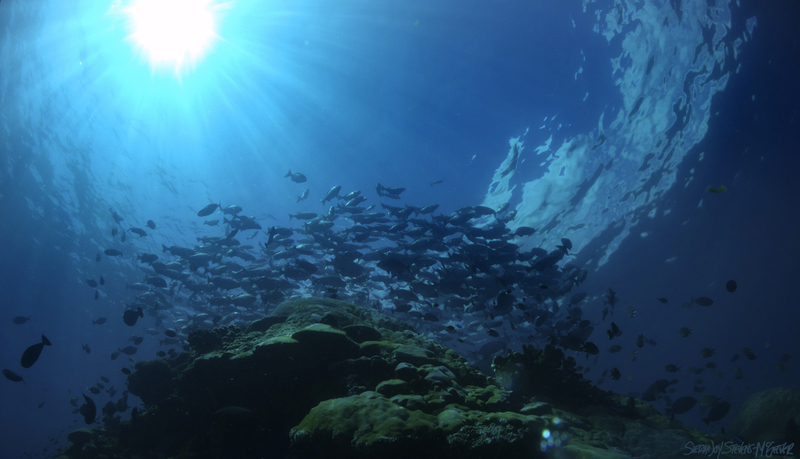 As we pulled towards the white sands of Gili Air, a wave and a few surfers caught Dave’s eye. “Honey look.” The swell was down so we weren’t expecting to find waves on Gili T.
It did, so we made the instantaneous decision to jump off the boat. In their journeys, from rugged slopes to the salty embrace of the sea, rivers pass through dense forests, narrow canyons, open plains with long vistas. Riding on their waters can bring you into an otherwise inaccessible landscape, into the thickest forests, through tall walled gorges filled by rushing water, and let you pass unnoticed by the banks where wildlife come to drink. Add to this the thrill of a turbulent ride and the exhilaration of navigating rapids, and you have my love of river-rafting. And so, in the crowded heat, laying under a ceiling fan, I signed Dave and me up for a white water rafting trip down the Ayung River. 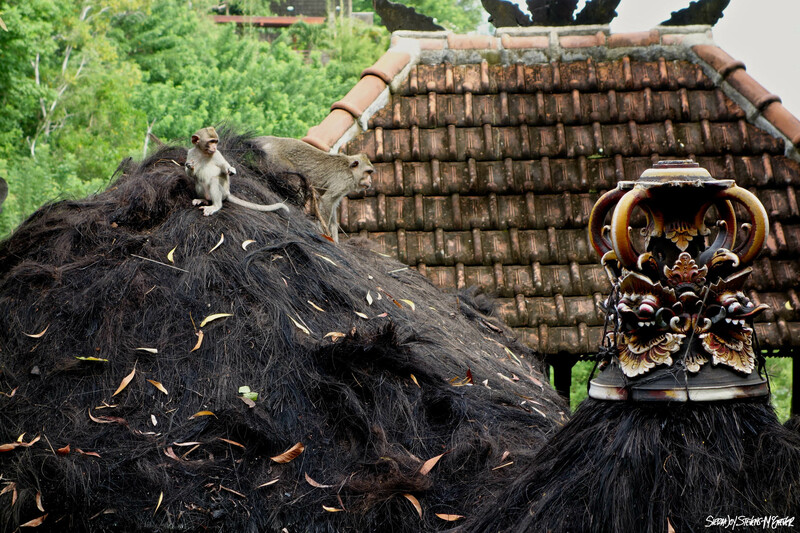 We saw our first monkeys today on the temple roof above Padang Padang, perhaps the most famous left hand barrel in indo. Small, nimble gray creatures, they move effortlessly from the temple ledges up into the trees and back. Overnight the swell doubled. Dave has been itching to surf Ulus. It looks great in the morning but we were told to wait for the mid tide. By the afternoon the wind is on the water making it roughly textured. It looked big and fun, but it’s hard with no reference points to tell how big it really is. Dave is impetuous, and decides to paddle out. 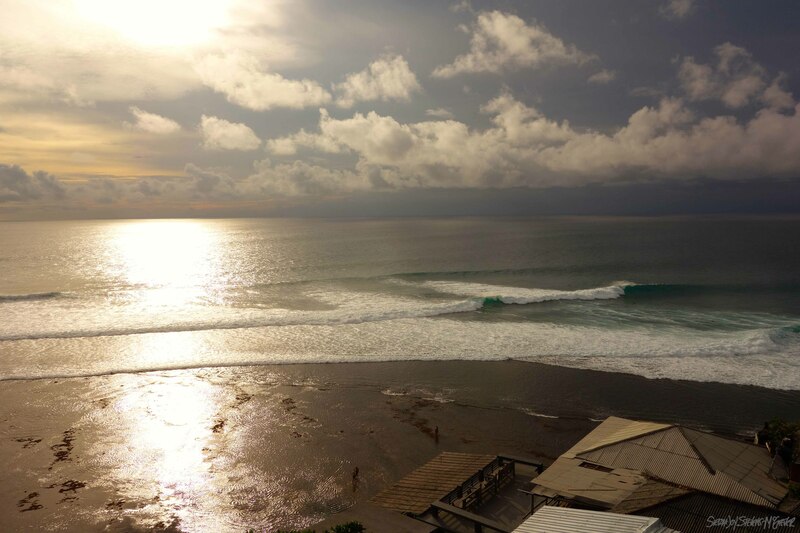 “We were told that most of the waves around, including Uluwatu, worked best on a medium low tide. With this in mind, we checked Ulu’s the first morning of our stay on this remote part of the Bukit peninsula. It was high tide, about 20 people out, and the waves were huge! Watching some of the surfers drop in, it was clear that the waves were at least 20 ft on the sets. 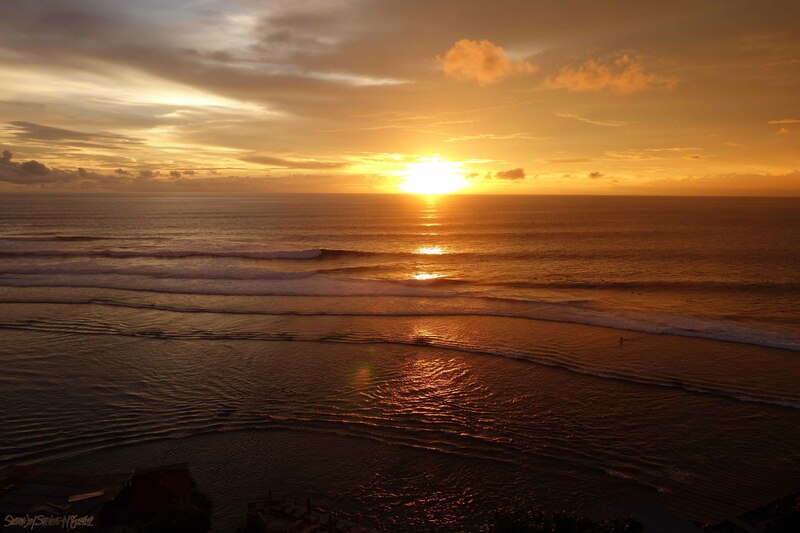 Knowing that my board was not big enough, and hearing that high tide was not the best time to surf, Sierra and decided to visit the famous Uluwatu temple and wait for the conditions to shift. After spending a few hours at this beautiful temple, which is perched on a 500ft cliff overlooking the water, we decide to head back home, eat lunch, and then check the surf again. 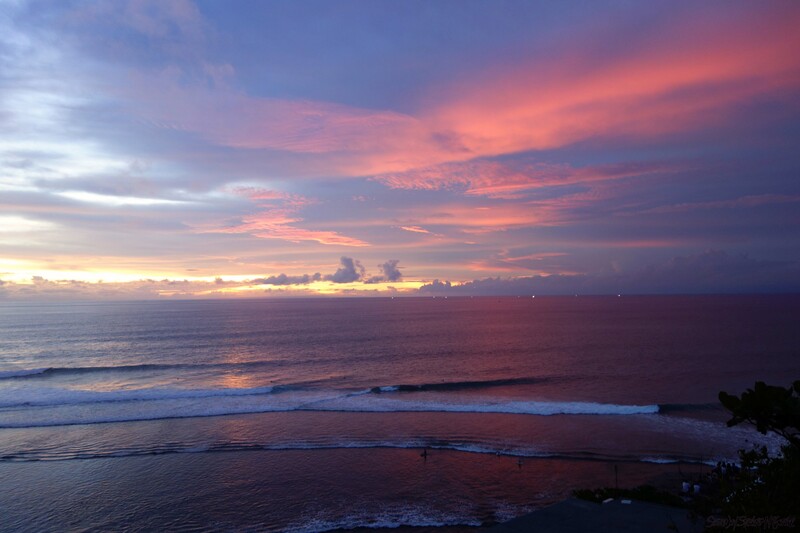 Uluwatu is a truly special place. The volcanic cliffs in this area are tall, and entrances to the beaches below are through steep slots in the rock. It was low tide during our first trip down to the beach at Uluwatu. We took a series of steep stairs down the cliff, between rocks that are flooded sea caves at a higher tide, out onto a small section of sand, beyond which stretched the reef, now partially exposed by the tide. The reef at low tide sectioned off various pools in which children splashed and adults waded. Beyond the pools, lay the reef crest and then the waves. Big beautiful lefts traced the edge of the reef, peeling along perfectly. Dave was enthralled, like a kid in a candy shop. We hiked up the stairs. 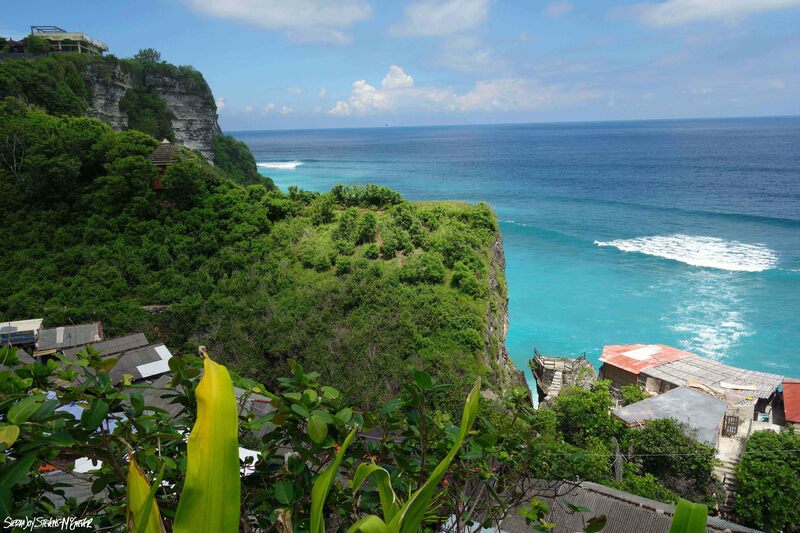 The path took us through the town of Uluwatu—shops of collaged materials are tucked on top of one another along the cliff face. Tourist souvenirs, surfboard rentals, cafés, laundry, mini markets and a place advertising showers and a toilet. Narrow footpaths make their way between the shops and up the cliff. 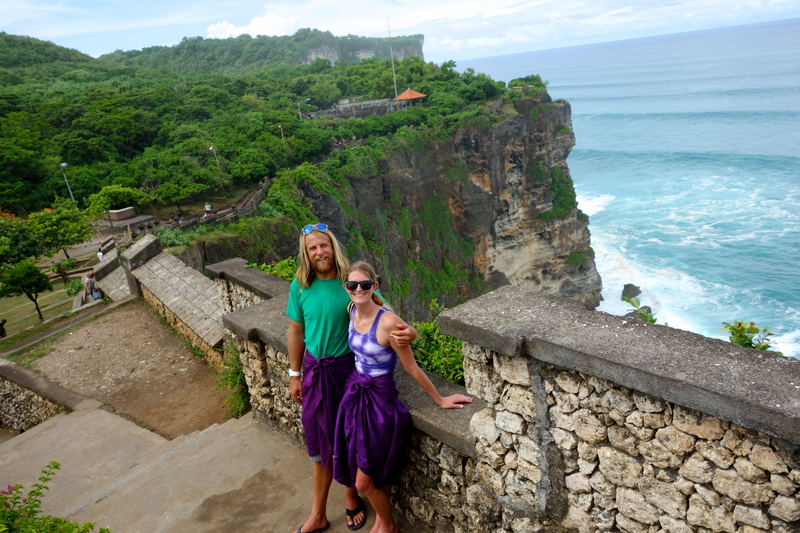 At the top of Uluwatu village lays perhaps the most beautiful ocean vista I have ever seen. The cliff point in the distance is covered in lush green vegetation, and gives way to a vertical black face. Below is a series of waves. The lone left in the distance, nearly inaccessible, peels perfectly along the point. 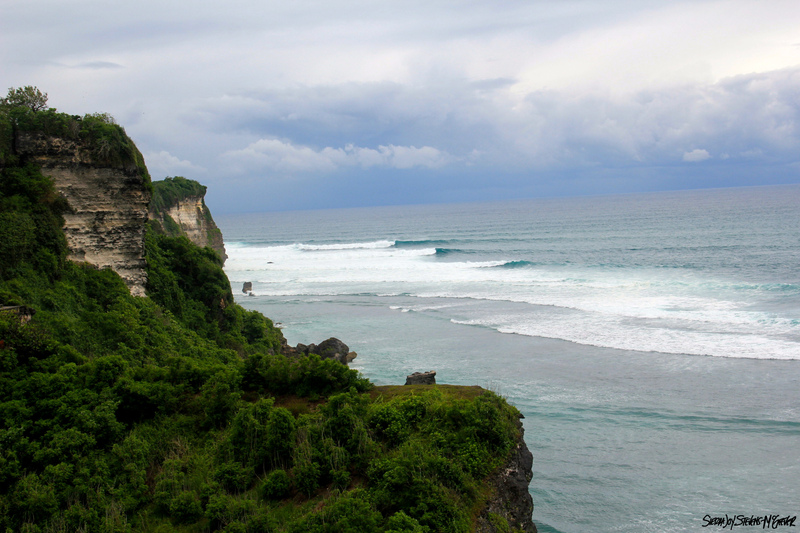 A series of reef breaks fire off in between the far point and Uluwatu, which is below us. Ulus is big and practically perfect, the type of wave you become mesmerized watching. We had dinner at our new favorite restaurant, Single Fin. Fins is at the edge of the top of the cliff. From the balcony you can watch the waves from the far point and see Ulus wrap around the point below. We dinned, drank unbelievable fresh juices and watched the sun set on the day, leaving the clouds first yellow then pink. Fourteen and a half hours from LAX across the great Pacific Ocean to Taipei. 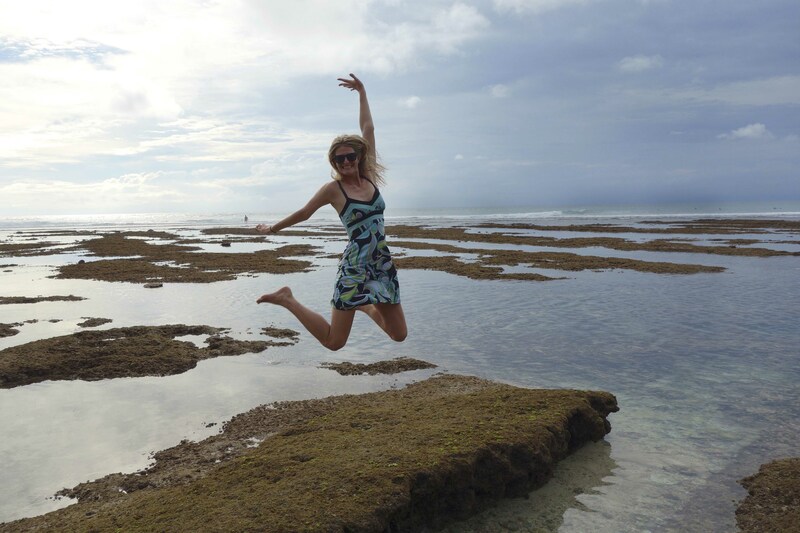 Four hours in the airport and five more to Denpasar, the capital of Bali. 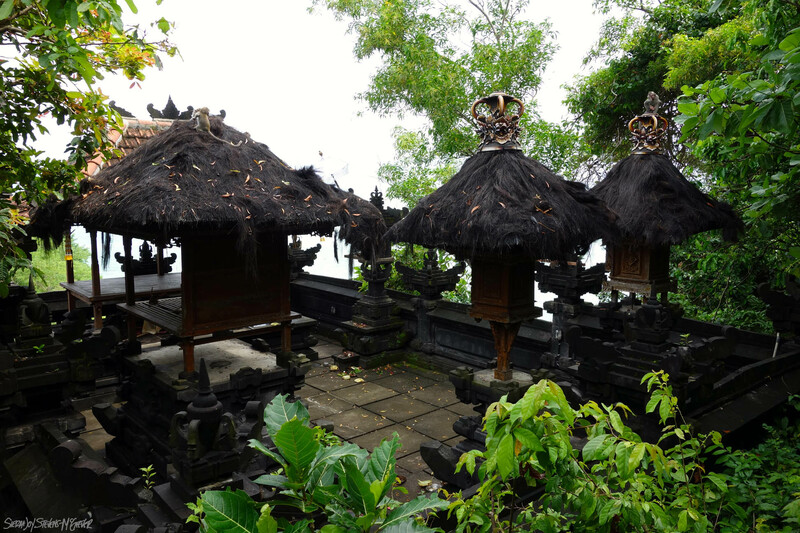 Bali lies between Java and Lombok in the island chain that makes up the country of Indonesia. The volcanic island is a little more than half the size of the big island of Hawaii. The tallest is mountain is over 3000m. Ninety two percent of the population is Hindu. Days here are pretty packed and wet. Dive in the morning, dive in the afternoon, afternoon excursion in search of YOYs (young of years….the fishy way of saying baby fish), dive in the evening, attempting to set up the equipment for doing a live stream from the dive site to classrooms on Grand Cayman. The team is made up of researchers, graduate students, people from the Cayman Island Department of the Environment, and REEF Volunteers, and of course Brice and Christy’s kids. We all gather at Peter’s house and talk about the day, what everyone will do, has done, has seen, plans to do. Meals are communal and everyone forms a wonderful working family of sorts. The bond between the people who have come for years is evident and they welcome us newcomers, all of us sharing our enthusiasm of the project and love of diving and fishes.